Virginia Governor Terry McAuliffe’s plan to allow convicted felons to vote was shot down by the Virginia Supreme Court on Friday. But to get around their ruling he has decided to sign 200,000 orders of clemency. The decision was 4-3 against the idea that felons should be allowed the right to vote when it was done en masse like the Governor did it. So McAuliffe is taking matters into his on hands to bypass the ruling. First a Victory for the Constitution, then…a lawless Governor follows in Obama’s footsteps. Governor McAuliffe signed an executive order back in April that granted the right to vote for some 200,000 convicted felons. In the past, a governor might be able to restore the rights of a convicted felon, if done so individually, as we previously reported. 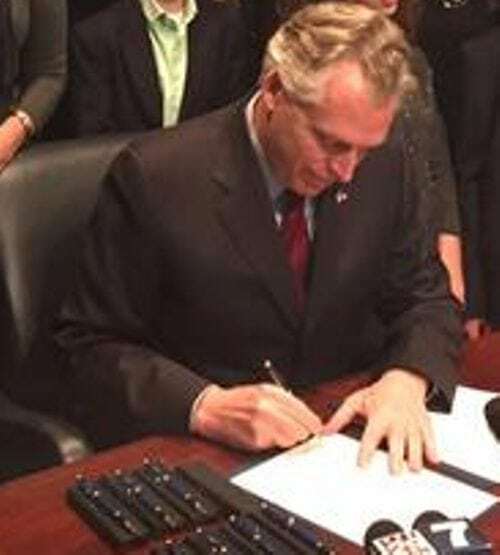 But in this case, McAuliffe planned to immediately start a voter registration campaign for all 200,000 eligible felons. In an election year. When he’s friends with Hillary Clinton. But that’s just a coincidence, right? The court ordered an immediate cancellation of the over 11,000 felons already registered. Republicans in Virginia stated that the Governor had overstepped his authority with the Executive Order, and the court seemed to agree. Virginia is a swing state, and normally Republican. With this election, who knows where it will end up? Not all convicted felons will vote Democrat, but some – maybe enough – could push the state toward Clinton.